With so much skills inherited within his pictures, why did Tony Au have a problem making even MORE masterpieces after Dream Lovers? From my point of view, however much he invested himself in visuals, Au tried to be equally much a storyteller. But they were attempts, not slam dunks and while Au Revoir, Mon Amour represents a rise in quality compared to the largely abysmal I Am Sorry, it's does not exactly meet the expectations clearly in the filmmaker's head. Setting a small story against a large backdrop, in this case World War II, is rife with interesting conflicts within the characters and in the greater scheme of things. The film does put forth those complexities, especially when dealing with issues of unification, rebellion, if love can co-exist in any shape or form during wartimes and the effects of war on any type of people. There's a flip-flop in Au's film here, that's a major point. At certain moments, especially when first looking back at Mui-Ye and Shun's initial connection, that generates interest for the coming reels but Au rarely seems to generate emotions with his audience. Anita Mui's character showcases ache in extreme ways throughout but we're left out in the cold, looking in and not feeling the essence of what makes any of the tears felt. In general, underdevelopment is to blame but as we roll along, Au fills up certain sections with subtleties that enhances character choices, even if only slightly beyond the basic level. Take for instance Carrie Ng's character Miss Ng, in love with security officer and Japanese collaborator Tieh (Norman Tsui) for reasons generally not spoken of. It's just passion and she even attempts to take his life at one point. Just minor twitches in the character behaviour for a moment helps the film, even makes one immersed in it. Then much crumbles as so much commentary and themes are on the nose, it's kind of condescending. Wish Tony would make up his mind. No doubt the minor effect Au Revoir, Mon Amour has on the viewer has much to do with the craftsmanship technically. Make no mistake about it, this is a first rate production with stunning cinematography by no less than a team of four (1*). Yet the various detours into sepia toned flashbacks, colour play and sweeping camera moves feels united, capturing Eddie Ma's (2*) art direction perfectly. Shanghai was even under Japanese occupation before the outbreak of the Pacific War in 1941 the epitome of glamour and glitter as highlighted during some of the film's initial moments. This crew doesn't hesitate either to add the ugly side, including graphic violence (3*). They're all aiding Gordon Chan & Liu Wing-Leung's script intentions as best they can but with conflicted Tony Au at the helm, it's a shame the fine effort isn't for an effort of the masterful kind. While the main actors go for it mostly, they can't bring enough to materialize the warmth and heart that clearly is cemented in the script. They certainly are totally immersed in the war torn world of Shanghai but we get an odd, insecure direction of Anita Mui as she cries pretty much every two scenes. It's like watching a TVB soap and not a high budget Golden Harvest production! Japanese actor Hidekazu Akai seems to be some kind of male window dressing but has a worthwhile character arc to work with as it turns out. Representing a rare force within the Japanese oppressors that wants the best for his country but to also make co-inhabiting the city with its original citizens an integral part, he has the conscience to see past any politics and even use it to his advantage to further to plight of Mui-Ye and Shun. It's the mentioned subtleties thrown in by Au at points that also Hidekazu Akai aids the character with. It is a step up from I Am Sorry and a valuable history lesson but that wasn't Tony Au's sole intention for his grand war drama Au Revoir, Mon Amour. Clearly closing the window for us to take in what it's like to be lovers on ultimately opposite sides of patriotic desire, it's a cold movie experience where largely the visual splendor can be considered a nigh on perfect exercise. Everyone tries extremely hard and clearly delivers something but core ingredients about a triangle of characters wanting to escape a war torn reality seems to engage only Tony Au. A moderate recommendation but another uneven strike for the director. 2008 EDIT: Having watched the Taiwan edit, it's interesting to note that it does have extended scenes, some only slight but the biggest differences are in the use of more voice over (which the flick needed) in the Taiwan edit and many scenes are either differently edited or placed at different times. I'm not a fan to the extent that I can judge if the editorial decisions make sense in each respective version though. Some exclusive footage is available in each release, even alternate events of sorts but the pick for me would have to be the Taiwan version as it plays out more clearly and now the film becomes more of a watchable, yet standard melodrama. Deltamac does a first for Au Revoir, Mon Amour as they are presenting the Hong Kong edit with an English translation for the first time on home video. Prior edition from Megastar (released as Till We Meet Again although the print had no title alteration) actually was the extended Taiwan print (clocking in at 119 minutes as opposed to the 105 minute running time of Deltamac's disc). Only the Mandarin/Japanese language track was therefore made available and this edit of the film surely is worth seeking out. Deltamac presents the film in an aspect ratio of 1.81:1 approximately. Print has moderate wear but displays the fine colours of the design to a pleasing degree. The Cantonese/Japanese Dolby Digital 2.0 track doesn't suffer from any noticeable detractions. While the alternate Mandarin/Japanese 2.0 option would to the best of my knowledge be more preferable (considering the Shanghai setting), most of the Hong Kong actors does seem to deliver their lines in Cantonese so I guess it's a toss-up ultimately. The choices are here anyway and both tracks are post-synched I should also point out. The English subtitles has a number of grammar errors and sloppy wording but overall do not harm the flow of the translation. There's a handful of lines that are not subtitled but seemingly nothing vital is being missed. Traditional and simplified Chinese subtitles are also available. Only extra is the trailer. (1) Peter Pau, Peter Ngor, David Chung and Bill Wong shared cinematography responsibility and on his previous film I Am Sorry, Tony Au had Wong Kar-Wai regular Christopher Doyle on board. One of best assets of that film and Au certainly knows to surround himself with top personnel. (2) The late Eddie Ma lent his talents to a number of known productions, best showcased when collaborating with Ronny Yu on The Bride With White Hair and The Phantom Lover. 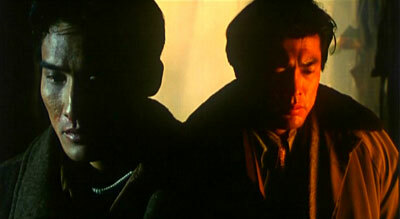 He also art directed The Christ Of Nanjing for Tony Au in 1995. (3) Supervised effectively by Mang Hoi, co-star of Zu: Warriors From The Magic Mountain and director of The Blonde Fury.